UNITED NATIONS, February 28, updated -- Weeks after the UN closed down its cafeteria and Delegates Dining Room in December 2011, a series of white tents appeared behind the Temporary North Lawn building, facing the East River. Nothing was announced; sources told Inner City Press the tents cost $170,000 and were for a single gala event by the non-profit CERES group. But then the tents did not come down. Sources said there was consideration of keeping the tents up for longer, to host the events that used to be in the Delegates Dining Room, like Venezuela's celebration of Hugo Chavez Frias. "Please provide a) a list of all the events which have taken place in the large tents on the North Lawn, b) who authorized such events, c) how much money changed hands for the privilege of holding events on the North Lawn, and d) who received such monies." "The tents on the North Lawn Building are a commercial space at the United Nations that are available to internal and external groups, just like the Delegates Dinning Room was previously. The tents are managed by Aramark. Please refer your questions to Aramark." 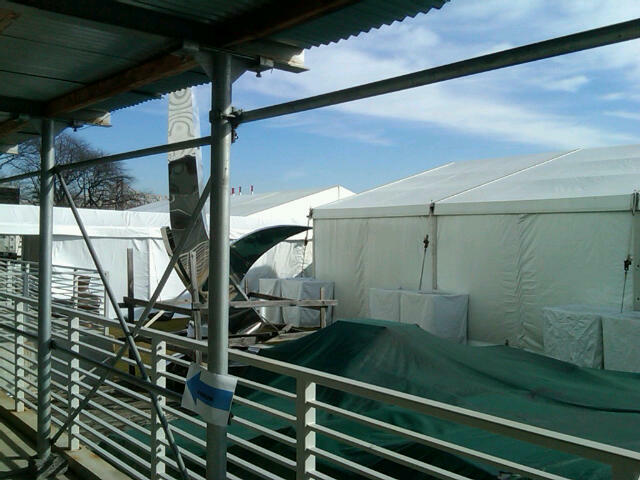 Does Aramark pay rent, to erect its tents on the UN grounds? While the UN spokespeople don't say, another source said that after CERES paid for the initially construction, "Aramark paid to improve the tents." But for how long? One close observer responded, "the implication from the non-answer is that Aramark gets to keep all the money it charges for events held in those tents. In this period of fiscal austerity, is Angela Kane's Department of Management allowing Aramark to fleece the UN by keeping all revenue from events that take place at the UN? It could be hundreds of thousands of dollars that the UN is giving away. Where is that money going? Not to the dozens of Aramark employees who were laid off." Update: click here for Inner City Press on Feb 28 tent use. "please state when the UN Cafeteria will re-open, and the status of the Capital Master Plan and the South Annex, including as regards the Tax Equalization Fund monies." "As stated in the note to correspondents we issued on December 16, 2011: 'Beginning 26 December 2011, the Secretariat Lobby will undergo renovation as part of the United Nations Secretariat Capital Master Plan. As a result of these renovations, the entrance to the Main Cafeteria will become inaccessible. Consequently, the operations of the Cafeteria will be suspended from 26 December 2011 until 30 June 2012.'" Aramark laid off many of its workers at the UN back in December; now they are essential sharing the remaining work in the UN Coffee Shop and Vienna Cafe. Some of them say they've been told the cafeteria will re-open in April. But the UN Spokespeople maintain it's June 30, 2012. A more senior UN official tells Inner City Press the reason the South Annex building, which holds not only the cafeteria but also the current spokesperson's office, is being re-evaluated for safety, in light of the traffic ramp off the FDR Drive which runs beside it. If the ramp is not closed, the official said, the South Annex might not be fixed -- or remain occupied. Watch this site.